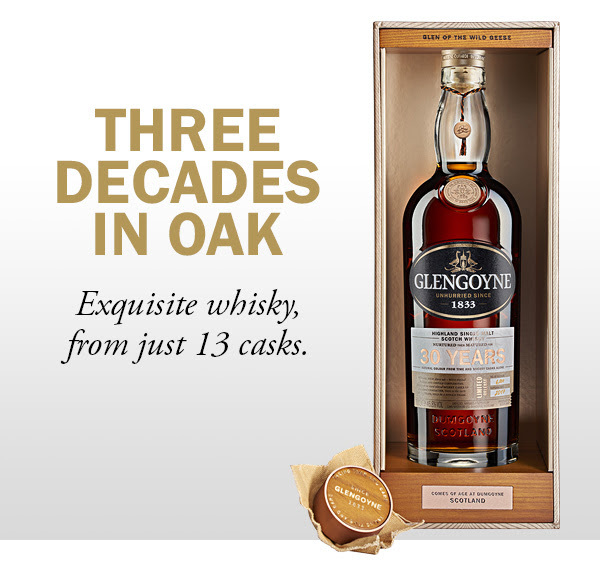 From 13 casks comes a super luxury 30 year old Glengoyne Highland Single Malt Scotch Whisky. Whiskytimes (by which I mean me and some friends) recently visited Glengyne distillery as part of a scottish holiday, and had a jolly good time. They has some of the best display work I’d seen, and the whisky was great too. it was so long ago i forgot most of what they told me about their place, but there was some interesting stuff around once having had the royal seal of approval, and their storage and maturation faciltiies technically being over some kind of boarder form the distillery. The important thing to know is the Glengoyne 30 year old looks and sounds amazing! I like their 15 and 18 very much, and polished a bottle of their 21 with some friends over new year 2016, to much approval. The 30 yo is limited to 6000 un-chill-filtered bottles, presented at 46.8% ABV and it comes in a pretty Oak box. It’s heralded as having been ages in ‘impossibly fine’ sherry oak casks - Living in a probabilistic universe precludes such a thing of course, but I just take that as meaning the cast were very good indeed. As I don’t have much more to add, i’ll just link you to their page about it: https://www.glengoyne.com/our-whisky/special-bottlings/30-year-old?